Courtesy photo Brigadier General Alice W. Trevino, Commander of the Air Force Installation Contracting Agency (left) with Mary Jo Koenig and Gary Koenig, who recently retired after over 40 years of federal service. Courtesy photo Longtime Piqua resident Gary M. Koenig (right) with Brigadier General Alice W. Trevino, Commander of the Air Force Installation Contracting Agency (left), holding a commendations letter from President Donald Trump after he recently retired after over 40 years of federal service. 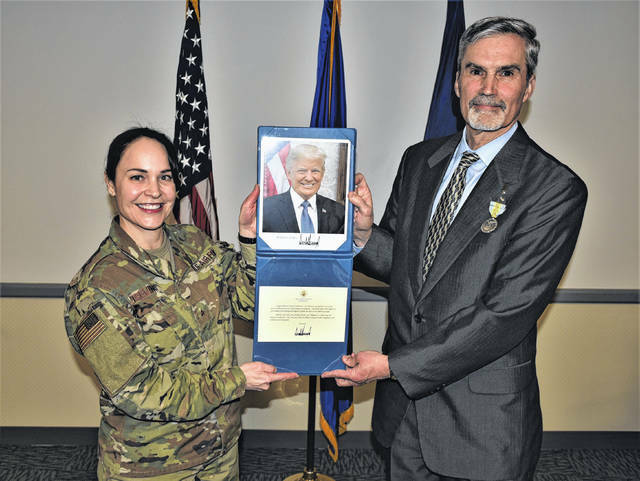 PIQUA — Longtime Piqua resident Gary M. Koenig recently retired after over 40 years of federal service, receiving commendations from President Donald Trump and the U.S. Air Force. The U.S. Air Force awarded Koenig, who most recently worked as a project manager and civil engineer technical advisor to the U.S. Air Force at Wright-Patterson Air Force Base for over 20 years, with the Award for Meritorious Civilian Service. At Wright-Patterson Air Force Base, Koenig led a $315 million roofing contract, saving over $4 million a year. The award also highlighted Koenig’s efforts toward the Air Force Installation Contracting Agency meeting its $1 billion savings goal four years ahead of schedule. “The distinctive accomplishments of Mr. Koenig culminates an outstanding career of service to his country, and reflects great credit upon himself and the United States Air Force,” read the award, signed by Air Force Installation Contracting Agency Executive Director Renee M. Richardson, SES, DAF. “I thought that was fantastic,” Koenig said. “It was nice to be recognized and appreciated,” said Mary Jo Koenig, who retired as a public health nurse in Miami County in 2016. Gary Koenig graduated with a bachelor of science degree from the U.S. Military Academy at West Point, Ny. in 1975 and a Master’s of Science degree in Engineering (Civil) Science from the University of California, Berkleley, Cali. in 1985. Koenig also graduated from the U.S. Army Command and General Staff College in Fort Leavenworth, Kan. in 1986. Koenig has an extensive background of working with the U.S. Army prior to his over 20 years of service to the U.S. Air Force. Between 1975-1995, Koenig served in the U.S. Army and in the U.S. Army Corps of Engineers between 1985-1995, serving in positions like U.S. Army Company Commander, Platoon Leader, and engineer. He was a project manager in Shreveport, La. between 1985-1989; the Chief of Staff of the Chicago District in Chicago, Ill. between 1992-1993; and the Senior Executive Officer of the North Central Division in Chicago, Ill. between 1993-1994. In Shreveport, La., Koenig worked on the Red River Navigation Project, which worked to make the Red River in Louisiana a barge-friendly canal. In Chicago, Koenig was part of the U.S. Army Corps of the Engineers’ response to the Chicago tunnel flood in 1992, managing the response to remove the water flooding the Chicago Pedway and more after a damaged utility wall beneath the Chicago River was breached. “Chicago was shut down,” Koenig said. After retiring from the U.S. Army, Koenig went to work for the U.S. Air Force at the U.S. Air Force Institute of Technology in Dayton and later at Wright-Patteron Air Force Base. Koenig worked as a research engineer and as a project manager on projects such as the construction of new buildings or data centers, roofing, and HVAC. Koenig also led the project to switch all of the U.S. Air Force airfields in the world to LED lighting and managed roofing contracts for all of the 70-plus U.S. Air Force bases in the U.S. Most recently, he managed an HVAC project for all the U.S. Air Force bases in the U.S. in 2019. “Uncle Sam has a need, and we put teams together,” Koenig said about the various projects he has managed throughout his career. Koenig said that the U.S. military is “the best employer ever.” Koenig said that he never had to deal with any student loans as the military paid for his education and then provided excellent benefits, opportunities to travel, and challenging work. “The people are fun to work with,” Koenig said. Gary and Mary Jo Koenig have two adult sons who graduated from Piqua High School, Adam Koenig who works in civil engineering for the Ohio Department of Transportation in Columbus and Gary Koenig, Jr., who is a professor of chemical engineering at the University of Virginia. 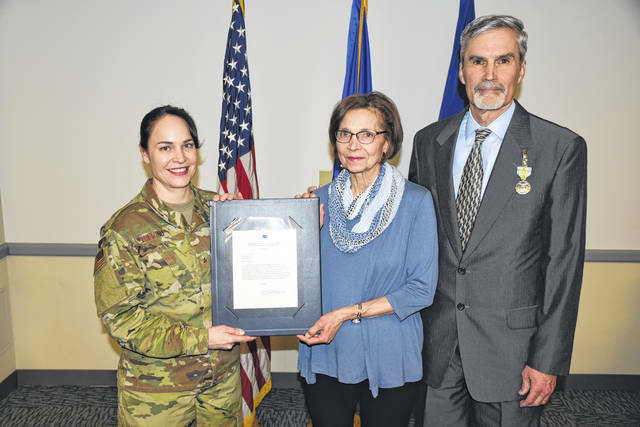 https://www.dailycall.com/wp-content/uploads/sites/30/2019/04/web1_DSC_1417.jpgCourtesy photo Brigadier General Alice W. Trevino, Commander of the Air Force Installation Contracting Agency (left) with Mary Jo Koenig and Gary Koenig, who recently retired after over 40 years of federal service. https://www.dailycall.com/wp-content/uploads/sites/30/2019/04/web1_PresCertKoenig-2-.jpgCourtesy photo Longtime Piqua resident Gary M. Koenig (right) with Brigadier General Alice W. Trevino, Commander of the Air Force Installation Contracting Agency (left), holding a commendations letter from President Donald Trump after he recently retired after over 40 years of federal service.